In a flattering interview with the New York Times, the Saudi crown prince and future king, Mohammed bin Salman, called the Supreme Leader of Iran, Ali Khamenei, the “new Hitler of the Middle East.” And he continued with a skewed comparison, saying: “But we learned from Europe that appeasement doesn’t work. We don’t want the new Hitler in Iran to repeat what happened in Europe in the Middle East.” The same rhetoric used Netanyahu when he agitated against the nuclear deal with Iran. This provocation by a regime that can only survive by the US American and Zionist sword and their financial tribute in the form of large weapon purchases and mercenary pay for terrorist fighters should have not future. But there is a sneaky plan behind bin Salman’s slander. It started with Donald Trump’s silly speech he delivered during his visit to Saudi Arabia in which he called Iran “the top state sponsor of terrorism.” And Israel’s Prime Minister Netanyahu called Iran “the world’s leading sponsor of terrorism.” Both leaders cooperate very closely in deranging the nuclear deal signed under the Obama administration. Now, Mohammed bin Salman has thrown himself into the fray. 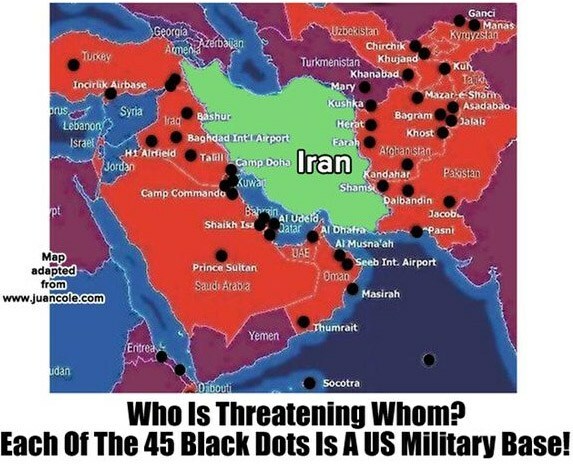 At least for the time being, President Trump is not jet willing, despite his anti-Iranian bias and rhetoric, to go to war with Iran for Israel’s and Saudi Arabia’s sake. To sacrifice American lives for two rogue regimes would be politically very unwise. That is why an image cultivation of the Saudi regime has already started in the United Kingdom and the US. In the case of Israel, the reporting in the US and the UK are one-sided and incredibly biased. Hence, the Saudis have to catch up. The British Guardian and the leading newspaper of the US Empire, the New York Times, have started to paint the new Saudi strongman, Mohammed bin Salman, as a kind of visionary reformer, although he has been spreading terror and blood since he took office. That Saudi Arabia has been fighting a brutal war against the people of Yemen, supports the different terror groups in Syria and stirs up tensions against Iran is silently skipped by Thomas L. Friedman from the NYT. Even bin Salman’s crackdown on large parts of the political and economic elite and his bloody purge against political opponents celebrate the NYT as a fight against “corruption.” Nobody should be surprised that the US and its major media outlets are embracing this brutal strongman because he serves US interests. Saddam Hussein was the best case in the point until he fell from US grace. Friedman didn’t want to be in no way inferior to the Guardian’s uncritical reporting. He even topped it writing: “The most significant reform process underway anywhere in the Middle East today is in Saudi Arabia.” All the other Arab Spring movements failed miserably happening from bottom up; the Saudi one is led from the top down by bin Salman. That the Crown Prince wants to reform a degenerated Saudi version of Islam seems worth reporting. Time will tell. Reading all these articles, one can ask who paid for these base flatteries. Why didn’t Friedman ask bin Salman about his 500 million US-Dollars worth yacht? Or the cost of the last vacation in Morocco, where he and his father’s royal household spent 950 million US-Dollars. So much to combat corruption, Mr. Friedman. Bin Salman also maintains an unconventional and rough diplomatic contact with other heads of states when they are on a Saudi drip-feed. When Lebanese Prime Minister Saad Hariri visited Saudi Arabia, he was forced to announce his resignation via Saudi TV. Apparently he feared for his life. For a few days, he stood under house arrest. Due to the speech of Hassan Nasrallah, the leader of Hezbollah, the whole Lebanese leadership rallied behind Nasrallah and called for Hariri’s return to announce either his resignation or to stay in office. The President of France, Manuel Macron, also intervened on behalf of Hariri. Finally, Hariri could leave Saudi Arabia via France from where he returned to Lebanon to celebrate the country’s independence day. Bin Salman’s farce failed miserably. Almost the same happened to Palestinian President Mahmoud Abbas. The Saudis ordered him to Riyadh and presented him an outline of the American Israeli “peace plan.” After returning to Ramallah, Abbas rejected the US Zionist document of surrender. It’s an open secret that the Saudi and the Zionist regime are cultivating intensive diplomatic contacts not only on security issues. A rare interview by the head of Israel’s armed forces to a Saudi owned news outlet fueling talks of close links. Despite the denial of the Saudi foreign minister Adel el-Jubeir, these rumors won’t disappear. “There are no relations between Saudi Arabia and Israel,” Jubeir said. Formally, he seems correct, but what about the informal contacts. Hasn’t Mohammed bin Salman visited Israel in camera? According to Danny Danon, Israel’s ambassador to the United Nations, Israel enjoys “warm relations” with many Arab countries despite the fact that these nations officially refuse to recognize Israel diplomatically. Prime Minister Netanyahu has been boosting for quite some time about the close contact with several Arab countries. The Israeli Saudi US American alliance aims at Iran. They want to push back Iran’s influence in Iraq and Syria. For the time being, bin Salman’s plan to sell Israel to war against Lebanon to crush Hezbollah has failed. Hariri was not the Saudi stooge bin Salman thought. What these three rogue states have in common is the destruction of Iran like they did with Iraq, Syria or Libya. Netanyahu has warned President Bashar al-Assad not to allow Iran to build military bases in Syria. Israel will never accept it as they will never tolerate a nuclear Iran, so Netanyahu. It remains to be seen whether the new “Axis of Evil” or the Russian Iranian Turkish alliance will prevail in the Middle East. So far, the Zionist US American and Saudi cooperation have brought devastation to the region; it’s time Russia and the other rational actors bring stability back to the area.